Time to share some of my most prized possessions - organic & screen-printed by Australian designers. 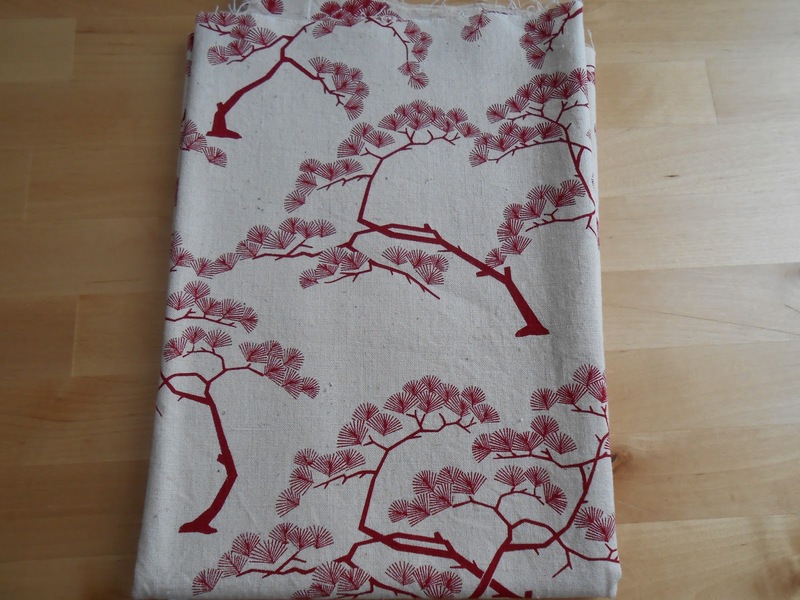 First up, this gorgeous cotton/hemp blend - half a metre (1.5 m wide) of Bonsai in Deep Red by Ink & Spindle. Isn't it shameful that I got this over two years ago and still haven't found the project for it? They don't even sell it anymore! If you love it as much as I do, you can still find it on Etsy. I bought it with a bag in mind but stashed it, and then I made and was so fond of my Echino bag in spring 2011 that I just kept using that through autumn and winter and the next year. It might become a bag after all, or maybe something else. 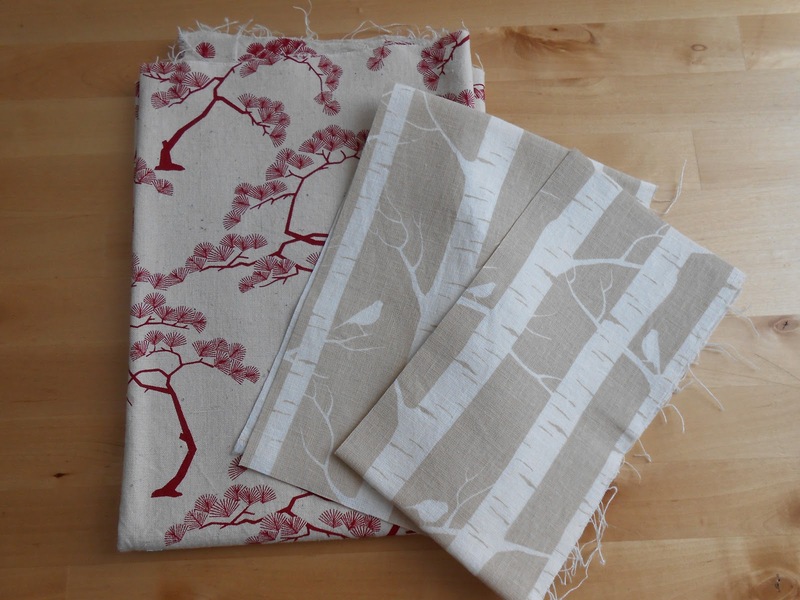 I still have remnants from the commissioned cushion covers I made last year from another Ink & Spindle print, Birch Forest in Almond. Further, they had a discount two weeks or so ago and I caved in and bought half a metre as well as two 'fat quarters' (actually larger) of three prints, respectively, two new ones and one I'd been coveting for ages. Pictures once they make their way through Customs and into my greedy little hands. Hopefully they'll make it onto the cutting table soon, too. They're much to nice to be stashed only. Another Australian designer with extremely lovely prints is Yardage Design. Once more skint, studenty me got lucky and I obtained three wonderful fat quarters during a sale late in 2011. However, I actually made something from one of those, namely potholders out of the blue print the second to last Christmas. No pics, alas. I'm especially fond of the Verano Leaves in Crimson. So pretty. 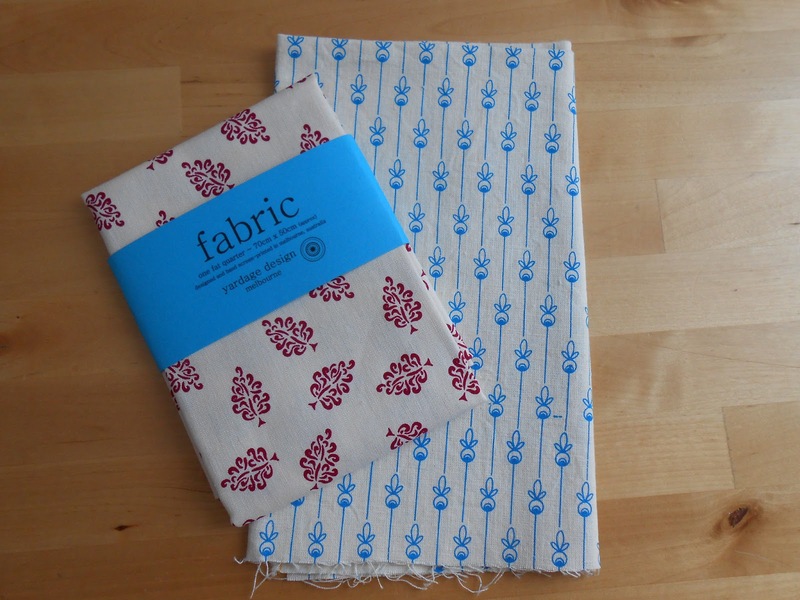 Yep, I'm addicted to the loveliness of screen-printed fabrics. I'm also guilty of at least three brimful imaginary shopping carts, and that without counting the skirts and fabric I want want from Poppy that I only discovered this morning... Job hunting must be successful soon.. Linking up with Fiona's Sunday Stash. Ooh such pretty prints!! Love the Bonsai! Great that you like Australian designers. Hopefully they are affordable with the postage.